I just noticed the fireworks when they announce each skater/pair/couple. I approve. Go Piper/Paul! 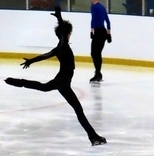 Please qualify for the GPF so I can see your free dance an extra time, it’s my favorite program of any discipline this season despite the fact that I know nothing about dance. It’ll be interesting to see Papadakis/Cizeron for the first time this season. key points are slowish in tango. I am surprised to learn Roxie is tango? Foxtrot, I see. Why this song in RD too? Hands off Guillaume's chest - I love it!